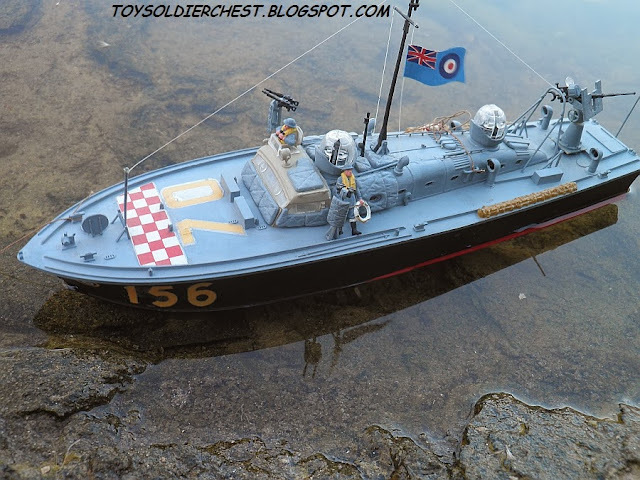 Toy Soldier Chest: Airfix RAF Air Sea Rescue Launch boat 1:72 A05281 R.A.F. 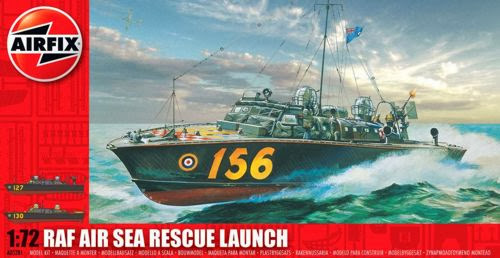 Airfix RAF Air Sea Rescue Launch boat 1:72 A05281 R.A.F. 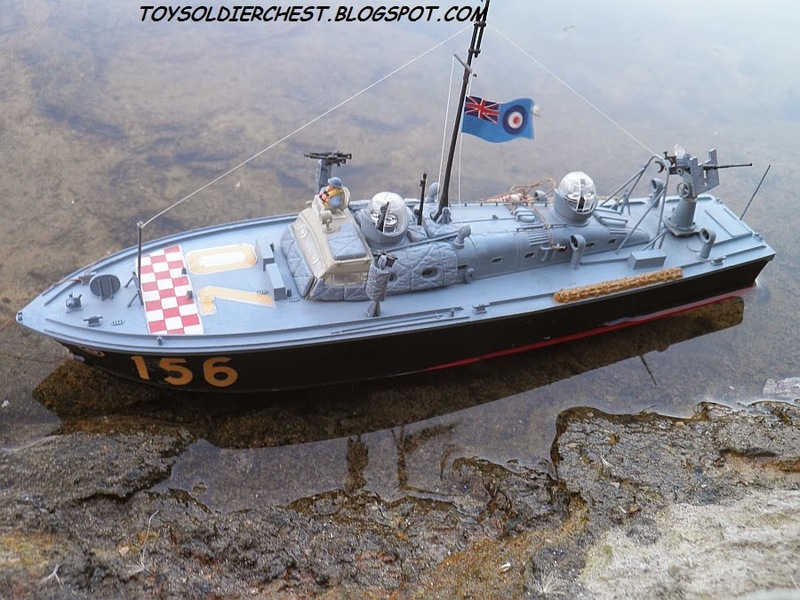 Today we review a entirely new subject to this blog, a 1/72 boat, the RAF Rescue Launch from Airfix. The original one. Personally, not very good, it deforms the shape of the boat, ok, it is to give sensation of "speed", but this would be fine for a comic-book, not so much for model kit box art. 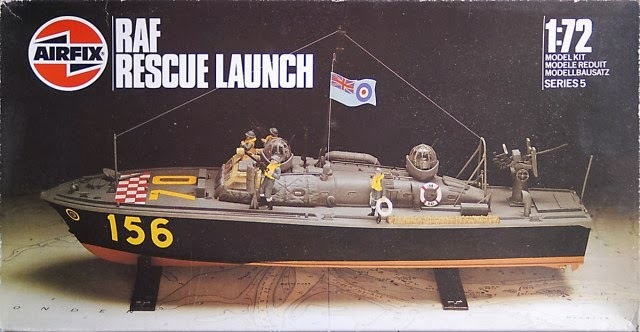 As with nearly all Airfix models, in the 80s they decided it was better to actually picture the models instead of box art. In this case, the kit was very nicely built, and it turns out really well. This is the one I bought back in 1998. And finally, 34 years later, it is considered that mankind hasn't evolved so much, and the same artwork than in 1979 is reused, just adding a realistic sky, which gives a quite sloppy effect. 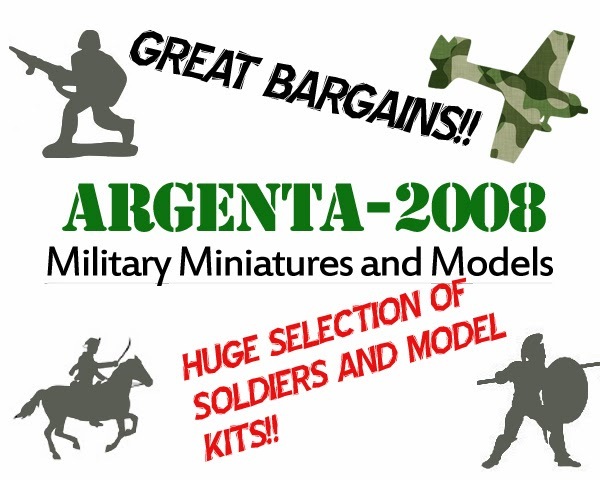 Certainly Airfix doesn't want to spend too much in unnecessary things. 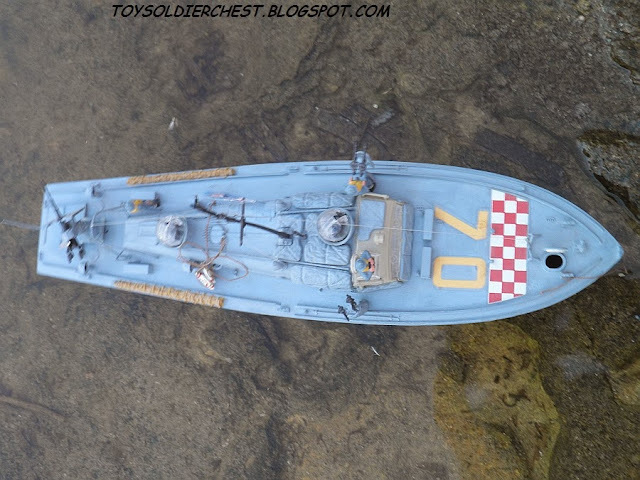 Even the number on the boat is not valid anymore, as Airfix has changed the numerals. This is a kit of good detail, very good really if considering it was first made in 1979. 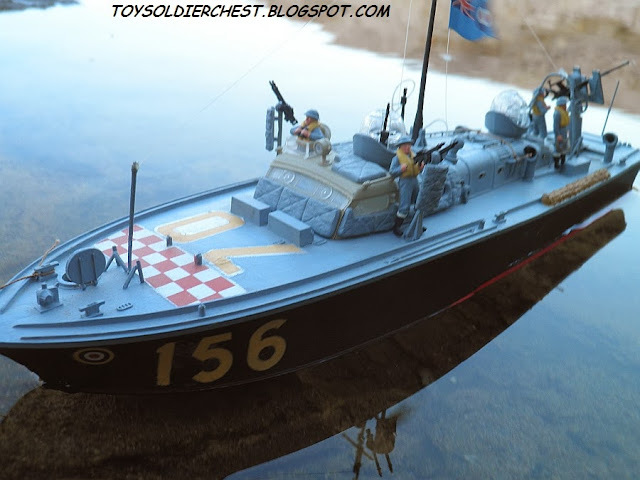 It has no major inaccuracies, and it builds into a very nice and good looking model. All the same, this can be very easily solved by trimming the pole. 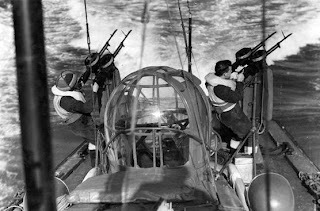 The 4 crewman are a very good extra, even if one or two pilots struggling or being rescued would have been perfect. It also includes a inflatable boat. 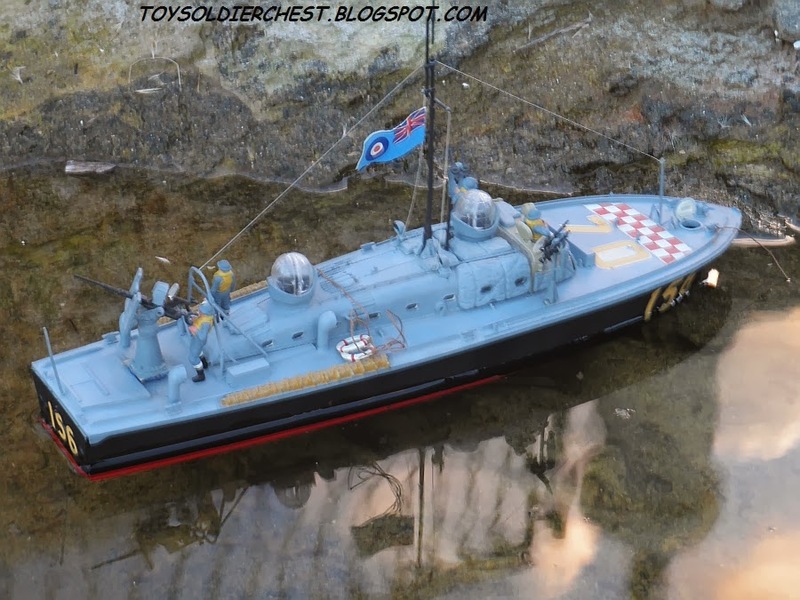 Not much to do here, besides making a commando version, or maybe a captured one by the Germans. It averages between 15 and 20 pounds on eBay. It is quite a big model, but not too cheap, considering that there not many more parts than a twin-engine. The historical importance score is determined by how many were built, and how much operational service they had, and how much influence they made on the conflicts in which they were involved. 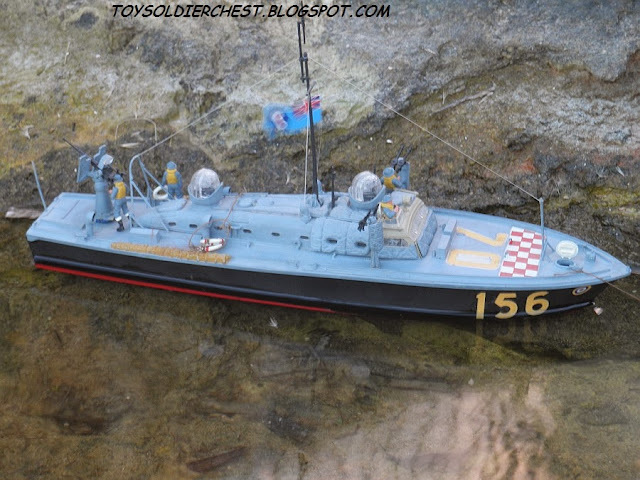 70 boats were built, and they saw plenty of usage throughout the war. There are not many 1/72 naval model kits out there, and much less kits priced at affordable prices. This is one of them, a kit that will please and interest both aircraft, naval and general ww2 kit builders. In one phrase; one of the triad from Airfix boats. A true classic. 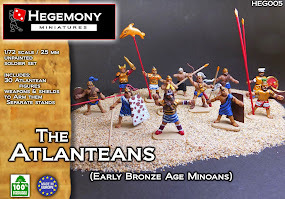 If you've liked this tutorial and want to say thanks, one way is just to make a click on the advertising below, that will help me buy modelling materials and dedicate more time to the blog and less to work! Model kit made by myself. .
Until the next rescue mission!!! What is the significance of the powder/skyblue color scheme? Is this a pre/post war livery, or some camouflage scheme I am not familiar with. In any event, it is a nice looking build. Concrgalations, and best of luck in your future endeavors.